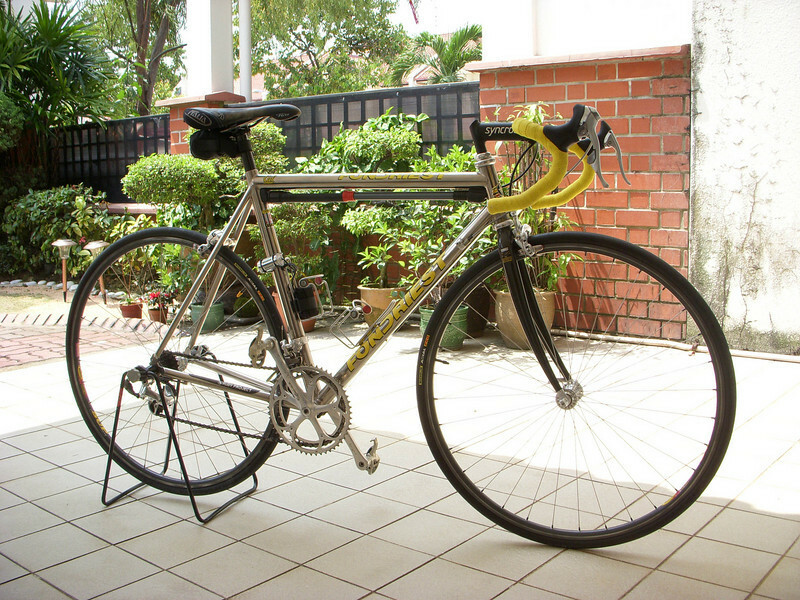 I got this Merlin Extralight in '97 from Kenneth Tan at Cycleworx in Singapore. It was my beloved bike for many, many miles of hard training with Kenneth and the gang - miles that were agonizing and snot-inducing, but fabulous miles nevertheless. The Extralight has a basic set of Dura Ace 8 and 9-speed components (everything except the crank, BB and shifters are from the 7700-series), and a 12-21 cassette. Singapore is fairly flat, so if you need a lower gear than 39/21, you're pretty much off-the-back and getting dropped. In about 2000, because the original Merlin decals were so worn from weekly washings, I decided to strip the bike and polish it. About 2 or 3 weeks and 2 or 3 tubs of Autosol later, the entire frame was sparkling like a factory-polished Litespeed. I did not have any replacement Merlin decals so Kenneth gave me a set of Fondriest decals. Now, the Fondriest decals were very rare, especially as they came as a set for a sponsored Fondriest titanium team bike. There were downtube, toptube, seatstay decals, as well as a real headtube badge and a "Titanio" tubing decal. Kenneth, through racing in Europe in his glory days and carrying the Fondriest line of bikes, knew Maurizio Fondriest, so I'm guessing that's how he got the set of decals that he graciously gave me. Even though I have very fond memories of rampaging around Singapore on this "Fondriest", it wasn't a very stiff bike. I remember rubbing its chainring against the front derailleur during hard intensity efforts (e.g., doing Mt. Faber intervals in a 42/19), and I am not exactly known for my sprinting capabilities (i.e., big quads). Nevertheless, it asked for very little and delivered a lot.